The male collie cross was discovered at the summit of Scafell Pike on May 16 by Scottish holidaymakers who took him home to Ayrshire. They contacted local animal welfare charity the Scottish SPCA, which issued an appeal to find the owner of the dog, whom they nicknamed Scafell but whose real name is Sid. Katrina Cavanagh, assistant manager of the charity's rescue and re-homing centre in Glasgow, says Sid was petrified when the holiday couple found him and they decided to take him home because they could not get help locally. 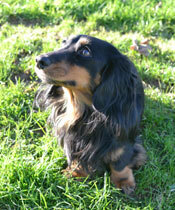 She says: "Unfortunately, Sid wasn't microchipped so we couldn't contact his owner directly. Thankfully, he came forward following our appeal and arranged for Sid to be collected as he wasn't able to travel to Glasgow." The owner is a sheep farmer and Sid is one of his working dogs. Ms Cavanagh says he was surprised to discover Sid was in Scotland but also very relieved to learn he was safe and sound.